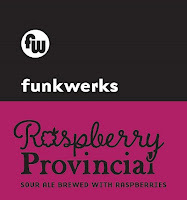 The Wine and Cheese Place: Funkwerks in stock ! Our flagship Saison was born from a series of test batches begun in Gordon Schuck’s backyard. The French Saison yeast strain used in test batch #6 was utilized to become the Great American Beer Festival gold medal-winning Saison that sits before you. Notes of passion fruit, tangerine, lemon verbena, ginger and black pepper. 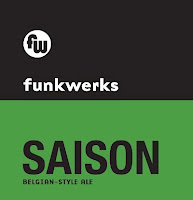 2011 Great American Beer Festival® silver medal winner in the French- and Belgian-Style Saison category. 2012 Great American Beer Festival® gold medal winner in the French- and Belgian-Style Saison category. 2017 Great American Beer Festival® gold medal winner in the Classic Saison category. Pairs well with cloud watching. 2014 Great American Beer Festival® gold medal winner in the Belgian-Style Fruit Ale category. Originally designed to be a hoppier version of our flagship Saison, the accidental (but fortuitous) addition of two extra bags of Munich malt balanced the hop bitterness leaving us this very unique Imperial Saison. 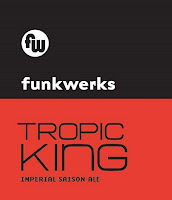 Tropical fruit flavors coming from the unique New Zealand hop variety, Rakau. Notes of passion fruit, mango, peach, pepper and ginger. Pairs well with hula hooping.